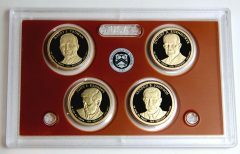 Today, Feb. 16, the U.S. Mint opened sales of its last proof set with coins wholly dedicated to United States presidents. RICHARD M. NIXON, IN GOD WE TRUST, 37th PRESIDENT and 1969-1974. Designed and sculpted by Don Everhart. GERALD R. FORD, IN GOD WE TRUST, 38th PRESIDENT and 1974-1977. Designed and sculpted by Phebe Hemphill. RONALD REAGAN, IN GOD WE TRUST, 40th PRESIDENT and 1981-1989. Designed by Richard Masters and sculpted by Joseph Menna. Coins in collector proof quality offer sharp, frosted designs that attractively contrast against their mirror-like fields. 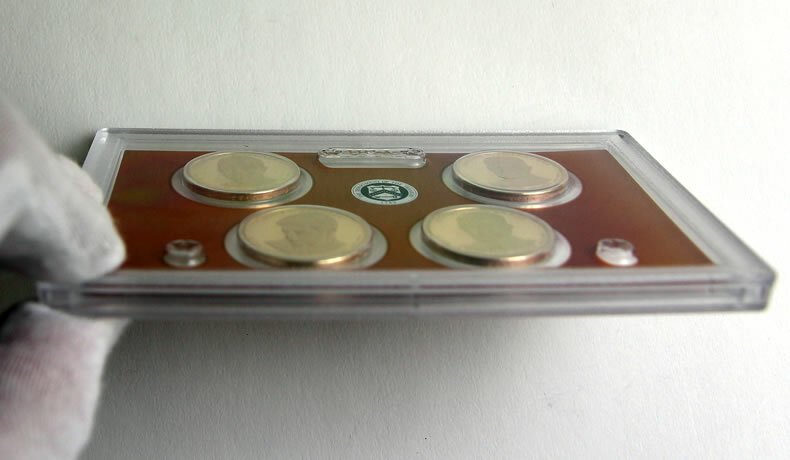 Proof coins are made by coining presses that strike hand-polished dies against specially treated metal blanks. In addition, standard coins for circulation are pressed one time while proof coins are struck at least twice, giving them sharper detail. Reverse images are common across the dollar series. They showcase Don Everhart’s rendition of the Statue of Liberty with surrounding inscriptions of UNITED STATES OF AMERICA and $1. Unlike most U.S. coinage, Presidential dollars have flat edges. 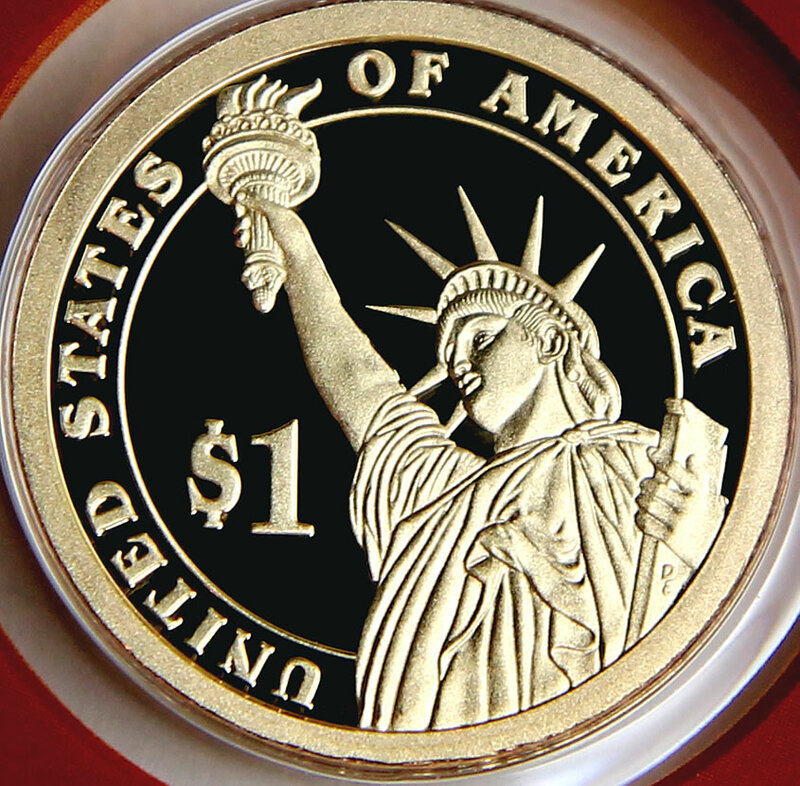 Incused lettering is added to the edge denoting the coin’s year of issue, the mint mark for the U.S. Mint facility of origin, and the motto "E PLURIBUS UNUM." All three of the set’s dollars bear the "S" mint mark to signify their production at the United States Mint facility in San Francisco. As an aside, CoinNews.net visited the San Francisco Mint late last year and captured photos of the three proof dollars. To protect their finish, coins of the proof set are held within a clear protective case or lens. 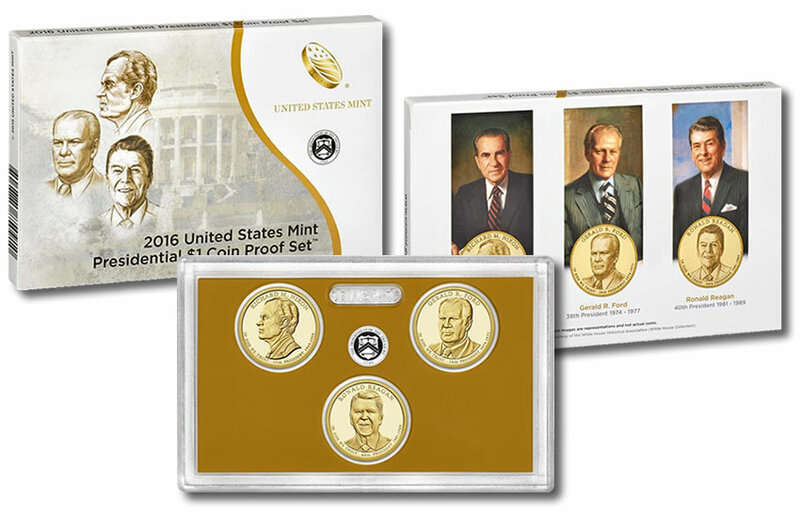 The lens ships inside a presidential-themed box along with a U.S. Mint certificate of authenticity. Priced at $17.95, order a 2016 Presidential $1 Coin Proof Set directly from the U.S. Mint website located here, or call 1-800-USA-MINT (872-6468). There are no product limits or household ordering restrictions. Based on trends from the past few years, sales should exceed 230,000 sets with over 110,000 sold in the next few days. Oh Oh, another opportunity for a packaging misprint. 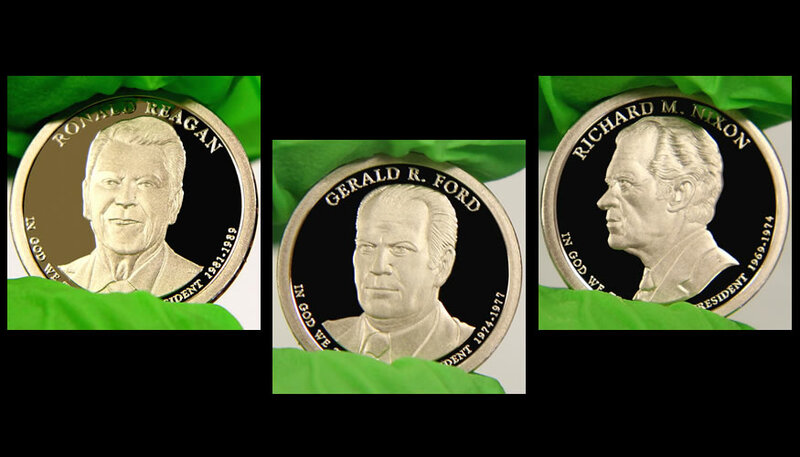 Hopefully somebody checked the order and made sure the right presidents were depicted on the packaging before ordering 230,000. Does anyone know if there will be any type of replacement for these $1 coins going forward? (Seth?) I know they are not made for circulation(as are the Native American Indian). I assume they will still make the Indian coins next year, or will that also end? If they will only be making the Indian coins, you would think the Mint would come up with another $1 replacement? I have always liked the reverse on these coins. If they end this for good, I hope they find another coin to use the reverse from this one. Just my oooo pin yun! That’s a whole lotta coinage sitting there. I’m sure in 10-15 years the TV coin guys will be able to tap into that “Lost hoard of Gold Presidential coins” to be able to unload on the public for a hefty profit. It’s the American way! Short answer is a No on the $1 coins. Ok well said. 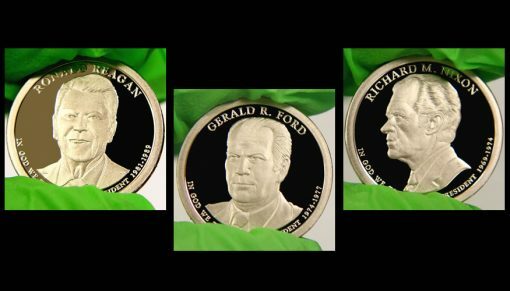 A poor design portrayal on the Reagan coin. I won’t be buying the set.